Pamplin Media Group - Winterhaven School student wins Regional Spelling Bee; headed to D.C.
Winterhaven School student wins Regional Spelling Bee; headed to D.C.
Agatha Chang, a Winterhaven School seventh-grader, is going to Washington, D.C., in May, for the Scripps National Spelling Bee. She might have started out with the last number in line, but when the dust and definitions settled, contestant No. 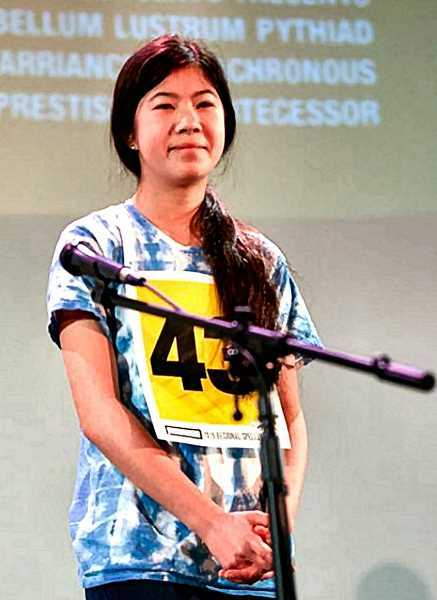 43 from the Brooklyn neighborhood was the last speller standing — and the winner of the Regional Spelling Bee! Her winning word? P-E-R-S-I-A-N. Along with the trip to D.C., Chang earned year-long subscriptions to several online dictionaries, as well. In an interview with the Pamplin Media Group, owner of THE BEE, which has sponsored the Spelling Bee for the last sixteen years, Chang credited her love of fantasy and romance novels as the key to her success. "I like reading. That's probably the main reason that I won – because I read a lot of novels above my age level," Chang said. And, of the win? "It feels really great." Proud parent Elleanor Chin comments that her daughter has "always had a great vocabulary." The battle of words began on Saturday, March 9, at the Hollywood Theatre in Northeast Portland. A total of 43 participants from middle and elementary schools, each the champion of an earlier schoolwide bee, appeared before a panel of three judges. Oregon Public Broadcasting journalist Dave Miller served as the official annunciator – offering up definitions, alternate pronunciations, and etymologies. When one student asked for the meaning of "angst", Miller recited a sentence expounding philosopher Martin Heidegger's dreary views on the topic. The Spelling Bee is also a bit of a world tour, lexically speaking. Some students heard the bell (and were eliminated) after being challenged by words such as "samovar", a Russian water kettle; "babushka", a grandma; "serdab", an Arabic word for cellar; and "backstein", a German cheese. Other students stumbled on the layout for the letters of "vermin", "monotonous", "prodigal", "ergonomic", "koan", "bayou", "opossum", "cachet", "colloquial", "tamarind", "chinos", and (perhaps a sign of the times?) "Kodak". Mark Garber, President of the Pamplin Media Group and publisher of the Portland Tribune, praised the crowd of scholars for their achievements before the first round. "The Pamplin Media Group's mission is to build strong communities through great local journalism, and the Spelling Bee fits perfectly with that mission," he said. "We have a room full of winners already."